Update: Yesterday our fearless leader, trump, changed much of what made going to Cuba easy. Personal "educational" trips are no longer a thing. You can still take a cruise or apply to go with a group. Keep this in mind when you decide to plan your trip. In 2016, President Barack Obama lifted restrictions on travel to Cuba. Up until this time, American citizens could travel to Cuba with special permission from the state department; one had to go with a tour group for a specific reason listed by the government. With his historic move, Obama made it so we as citizens can travel to Cuba much easier. While you still cannot travel for “tourism,” there is a list of 12 reasons for travel. My wife and I chose Educational Activities and planned our itinerary accordingly, which included museum visits, meeting with a film photographer teacher, and staying at a Cuban house for our stay. Many people have asked me about how we went about getting “permission” to go, and the answer is simple: we bought plane tickets. We chose to fly Jetblue so this is specifically our experience with them, however, I do not think that other airlines are going to be different. My friends flew Spirit and they had a similar experience, albeit worse, but that is because Spirit is awful. When you buy plane tickets the airline will ask you which of the 12 reasons your trip to Cuba falls under, and then they will send you an email affidavit which you electronically fill out and return. When we arrived at Fort Lauderdale Airport we had to get in line to purchase our Cuban visa, which, through Jetblue, cost us $50 (my friends said Spirit charged them $100 and only accepted cash.) We got our Cuban visa and our tickets were stamped to indicate the same. Other friends went to the Cuban Embassy in DC and got their visa that way which is also a choice, but with Jetblue making it so easy, we avoided that. When you arrive in Cuba, the immigration and customs is just like any other country in that they stamp your passport and let you in. Returning to the US was the same and we had the nicest customs agent we have ever encountered. He did not ask us a single thing about where we had been. The whole process was simple and required less hassle than our visa for Brazil or China. We decided to go before the inauguration in case that trump decided to make travel more difficult. With all that out of the way it is time to discuss being in Havana. Make sure you have cash as you will not be able to use credit cards or ATM cards while in Cuba (this goes for USA, but I think in other countries you can use your cards) and the exchange rate is 1:1 for the Cuban Convertible Note, the CUC. There is also another currency, though we never got any of it. We exchanged money at the airport; there were two upstairs and one downstairs. At the airport we picked up a taxi for 30 CUC to Chinatown area which is where we were staying. Our taxi had put a screen over his rearview - OK Cuba, I like your style! The ride to airport took around 30 minutes and took us directly to our house. Unfortunately, our house had a problem and we could not stay. In what was a good introduction, the owner had found us a better house at the same rate (30 CUC a night) closer to downtown to stay in which he walked us to. My wife found the place to stay on TripAdvisor forum which she often uses as a resource. Our first night in Havana we had no plans so we spent some time walking around and then turning in early, as we had gotten in later in the day. I wish I had the information for our new place as it was wonderful and the family who owned the house were great, but I was unable to get it from them due to the language barrier. The first full day we were there we were to fulfill our “requirements” of the visit so we headed over to the Plaza De Revolution to educate ourselves on the revolution that saw Fidel take power. The walk was about 45 minutes or so from our house and was pretty straight. We saw a lot of stuff on the walk including tons of nice people. The streets of Havana are narrow with houses on each side. At the center of the plaza is the Jose Marti Memorial which has a museum at the base. The museum is pretty nice, though it is not air conditioned. The cost to get into the memorial and the museum is about 5 bucks, so not too bad. If one is so inclined, there are taxis as well as pristine convertibles to take you around the city. We did not do this, though it is a popular choice. After the plaza, we took a long, meandering route towards Old Havana along the waterfront. There were men fishing over the scenic waterfront which was quite a sight. The car tours take you along this route so convertibles frequently pass by. We ended up strolling all the way to Plaza de Armas which is where we saw the most tourists, as this was close to where the cruise ships come into port and everyone gets off. There were shops and stalls, one of which where I bought an expensive Coke for 4 bucks! This felt like the most “fake” part of Havana to me. When one thinks of Cuba, they think of old cars and old buildings but here there were no old cars, just 78 million tourists and things to be sold to those tourists. I did enjoy the open air market in the park where people were selling posters, shirts, records, and books. That was really cool. This area also had an old pharmacy that is still in business. I was only able to take the one above photo as my film speed was slow and it was not that bright inside. The rest of the day was spent walking city streets and shooting photos, dinner, then back to our place. The next day was more of the same with the addition of meeting some friends of friends from Miami. We ended up walking around, shooting photos, and getting dinner. After dinner, we wandered about found a square with some open chairs where we relaxed and talked for about 4 hours. A stray dog hopped in my lap and fell asleep as I pet her which was a wonderful experience. I also met a photography teacher, Ossain. I was given Ossain's number through another friends, Nicholas, who knows Ossain through a Spanish film photography forum. I emailed Ossain before I came to let him know we would be around if he was able to get together and possibly go shooting. Unfortunately he was busy most of the time we were there, but he was able to come over the last night we were staying. We just sat and talked about film photography and he gave me some extensive history on Cuba; it was a lovely evening. A lot of people always ask about the food when we travel places, and the answer we always give is “Eh.” Neither of us are huge foodies (my wife is to a point but finding vegan options is not always easy) so we usually just buy food at a market and make meals at our hostel, hotel, or home. In this case, we ate at the same place twice, which was a Chinese restaurant. To give you an idea of how this place was, they had fries on the menu but had no fries. They had a full menu but only three of which were Chinese. The rest of the menu was a normal menu. The first night I got shrimp which was pretty good, and the second night I got pizza. I did get some absolutely delicious ice-cream on the street twice. Do not pass up street ice-cream! 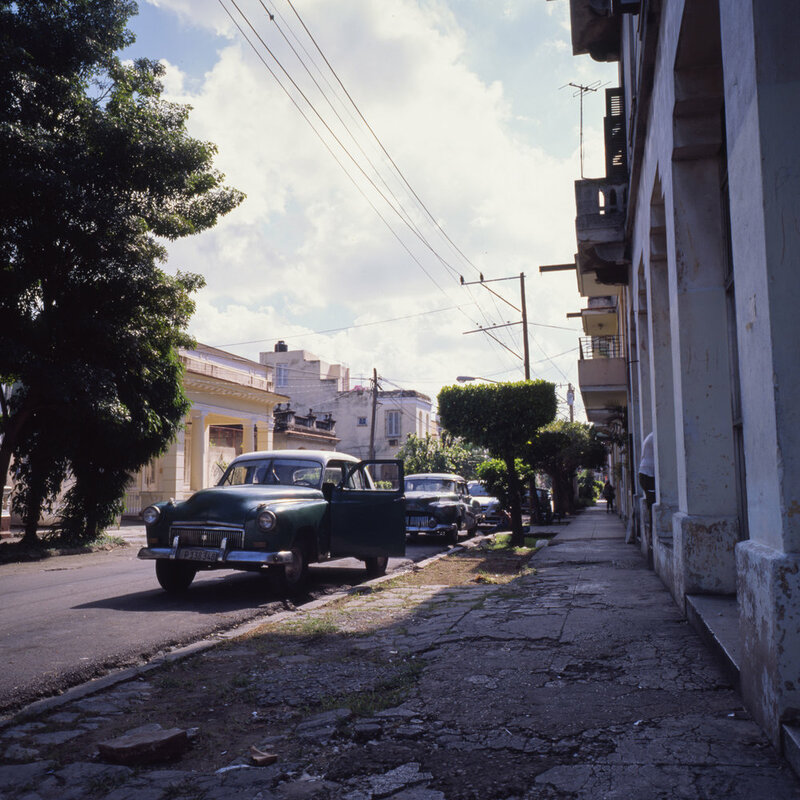 When people think of Cuba, they think of the cars. Everyone has heard it. I was ready to see them but I was not prepared to see as many as I saw. The historic cars were everywhere. If I wanted a photo with a specific color car, I had to wait a few minutes, at most, for that color car to come by. If I wanted to take a photo of a building on a side street with a car in front of it, I had to wait a few minutes. The amount of old cars there is staggering, as well as awesome. My wife and I both brought our Instax cameras, and unbeknownst to one another, we each planned on taking photos of people and giving them to whomever we photographed. Between the two of us we gave away about 80 photos to people on the street. As we both do not really shoot people, we weren't sure how people would react to this, but let me say, they absolutely loved it. My wife took a photo at the bar in the photo below, and after a few minutes, everyone in the bar came out, wanted their own photos and wanted photos with each other. It was absolutely amazing. The kids above were playing soccer in the street, and I took a photo of the kid in jeans. I handed it to him when it was done developing, and when I looked back, all the kids were so hyped. The kid in the blue shorts took the photo and ran into the house to show everyone, and then my wife took the remainder of her shots of the kids. I was out at this point. The people of Cuba were nothing short of wonderful. Everyone was friendly and helpful. Not once while I was here, both in the day and the evening, did I feel unsafe or uncomfortable. Without hesitation, I would visit Cuba again and explore more of the island. The return journey to the airport was a trip: we had to catch a taxi and some random guy on the street scooped one up for us, then hopped in, too. We had to get gas which we did at some random house out of a milk jug, then we were on our way. We took a different route to airport, which I think was to avoid paying a fee to drop us off. It was the perfect way to close out our short but wonderful trip to an island that seem shrouded in misconceptions. Go to Cuba and enjoy Cuba. We certainly did. You can view the entire gallery here, or a truncated gallery below. I have added the ability to keep up with these blog updates via email, just sign up and you'll get an email everytime I write a new post.